1241 – First notices of the village existing in the Danish Appraisement Book. The village belonged to Nycolaus de Orges and it was 7 ploughlands large, named Kuckarus. 1410 – A manor was built near the village. The original owner of the manor was Hans Maydel. 1413 – Hans Maydel gave the manor to Hans Lode for covering debts. 1453 – First mention of the existence of the Kukruse (German “Kuckers”) knight mansion, which was then the property of Fromhold Lode. 1745 – Via inheriting the property, the manor was obtained by Caspar Friedrich von Engelhardt. 1762 – Caspar Fridrich von Engelhardt swapped the Kukruse manor with the Ojasoo manor. The new owner was Christopher Friedrich von Toll. 1767 – The manor was inherited by Carl Gustav von Toll, who made the manor family’s unsellable inheritable manor. 1813 – Friedrich Ludvig von Toll became the owner. 1841 – As a result of drawing lots, the manor was obtained by Robert von Toll on 24th June. He was able to dedicate himself to the upkeep of the manor and the collection and processing of historical documents, after leaving military service. In time, the Kukruse archive became the largest and most valuable private archive in the Baltics, including the documents of manors, parchment records and the letters of statesmen. In 1935, the Educational and Social Ministry bought the Kukruse archive for 5000 crowns, giving the archive over to the central archive of the state in the same year. 1917 – 1923 – The manor was operated by Benno von Toll, the son of Hermann, based on a lease agreement. 1923 – The manor was expropriated by the Estonian government. The manor lands were given to new farmers and the manor house itself was given for usage by the shale industry. 1925 – The main house of the manor was opened as a Russian primary school, which in 1931 bore the name of Kukruse Russian Emigrants Primary School. 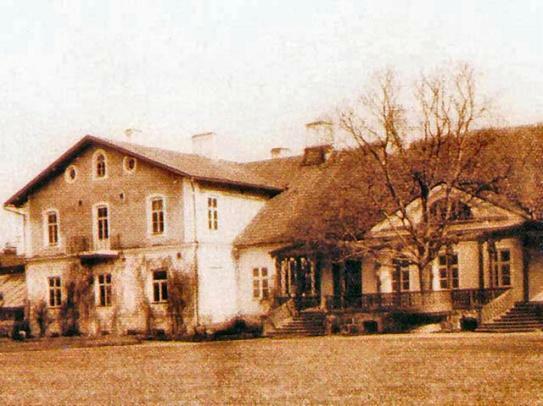 1945 – 1988 – The main house hosted the apartments of the Kohtla-Järve state farm employees and a shop. The barn building did not have a warehouse. 1988 – 2004 – Kukruse manor belongs to the state – meanwhile the manor was rented by the Jõhvi department of the Estonian Restoration Government. 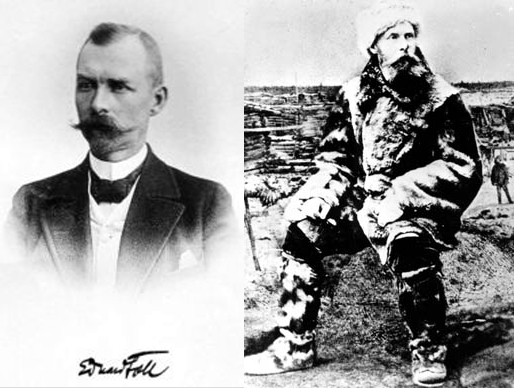 2010 – the newly renovated Kukruse Polar Manor opened the permanent exhibition of the Toll family, mentioning the life and activities of Robert von Toll and his nephew, the polar explorer, Eduard Gustav von Toll. The architecture of the building was continuously supplemented during the 19th and 20th centuries. When the manor house was built in the second half of the 18th century, it was complemented with a wooden manor manager’s house, a barn, 2 barn-dwellings, a beer kitchen, a sauna, a smithy, stables, a distillery and the stables of the steers. Of all these buildings, only the remains of walls are still visible. By the beginning of the 20th century, the amount of ancillary buildings in the manor was 30. 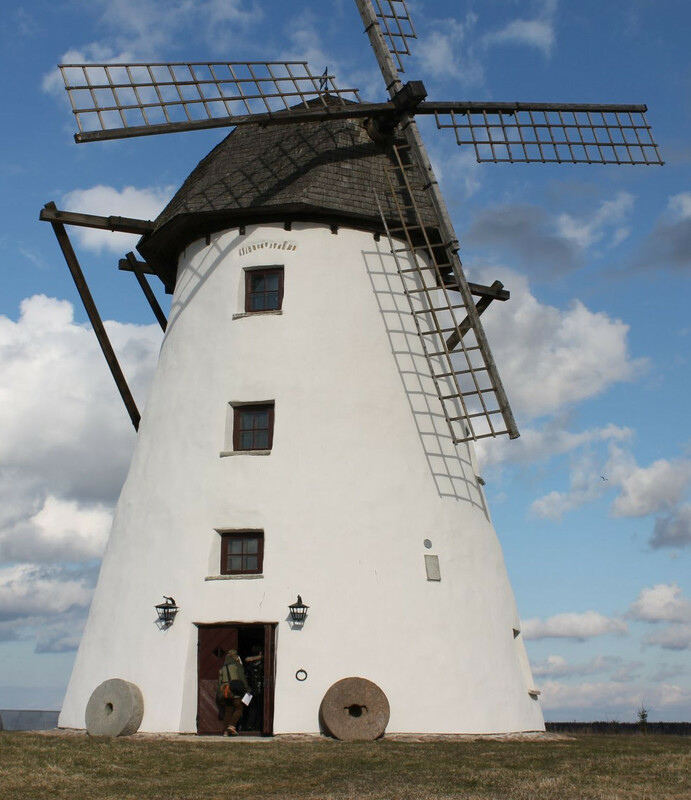 The buildings that survived, are the windmill, the barn building, the ice cellar and the complex of cattle barns. The dryer building has also partially been preserved. The construction materials that were used, were plastered fieldstone and limestone. In building the cow barn and the grain dryer, broken fieldstones were used, but the door and window opening were framed with red bricks. In the 15th century, when the original manor household was erected at Kukruse, the size of the manor lands was 13 ploughlands. During the centuries, the manor land has remained in approximately the same size, ranging from 12 to ploughlands, meaning 96 to 120 hectares. This way, the Kukruse manor was quite a big manor among other Estonian manors. The Kukruse village is situated in the historic Virumaa, Jõhvi parish territory, belonging to the modern Kohtla municipality of Ida-Virumaa. Some records of the Kukruse manor house can be dated back to 1410. Even though nothing is known of the manor house itself, it can be assumed that it was a humble wooden building that got damaged during multiple wars and maybe even got destroyed and was then rebuilt. The work on the current building started in about 1760. First, the building had only one storey and it was Baroque-style stone building. Some twenty years later, additional wings were built, giving the house a classicist appearance. The eastern wing was built in the same direction as the house, the western wing was built perpendicularly. A second floor was added to the western wing in the 19th century and another wing was added to it. When the building of the manor house begun in the 18th century, then additionally were also built a wooden master’s house, a barn, 2 barn-dwellings, a beer kitchen, a sauna, a smithy, stables, a distillery and the stables of the steers. Of all these buildings, only the remains of walls are still visible. By the beginning of the 20th century, the amount of ancillary buildings in the manor was 30. The buildings that survived, are the windmill, the barn building, the ice cellar and the complex of cattle barns. The dryer building has also partially been preserved. The construction materials that were used, were plastered fieldstone and limestone. In building the cow barn and the grain dryer, broken fieldstones were used, but the door and window opening were framed with red bricks. The Kukruse manor was in 1841 obtained by a history enthusiast, Colonel Robert von Toll (1802-1876), who having left the military service was able to dedicate himself to keeping the historical records of the manor and compiling the most valuable and the biggest private archive in the Baltics, which included the manor documents, parchment records and the letters of statesmen. The Education and Social Ministry bought the Kukruse archive in 1935 for 5000 crowns, in the same year, the archive was given to the Central Archive of the State. Altogether, the manor was associated with the Toll name for 161 years. Through the centuries, the manor land was of approximately the same size, ranging from 12 to 15 ploughlands, meaning 96 to 120 hectares. This meant that the Kukruse manor was quite big compared to other Estonian manors. All manors were nationalised in 1919. The Kukruse manor still remained in the private property of Benno von Toll until 1923, as the rent agreement lasted until then. When the agreement ended, the manor’s inventory was paid out to him and the manor was distributed among the settlement farms. The main building of the manor was obtained by the shale industry, in 1925 the manor house was turned into a primary school for Russian emigrants. For a long time, the manor house was an administrative and a residential building, until in the 1980s, the house was put under state protection. In addition to being a history enthusiast and having all kinds of other interests, Robert von Toll was also the President of the Estonian Horticultural Society. In 1866, Robert von Toll began to build a park complex for the Kukruse manor. Having brought many bedding plants and seeds from his travels abroad, the park had many different species in it. Of little-known tree and shrub species, the park had the Virginian juniper, the Douglas’ spirea, the common hoptree, the white and grey birch, the common laburnum, the Alpine and Pyrenean honeysuckle, the green alder, the long-branch and rough-haired brooms and the Georgian, Italian and red maple trees. A dendrological survey was carried out in 2008, which identified 26 different species in the manor park. From in front of the manor house, a notable larch-oak alley with four rows is headed to the family cemetery. The most notable tree there – the mourning oak, can offer coverage up to 100 people, due to its umbrella-shape. 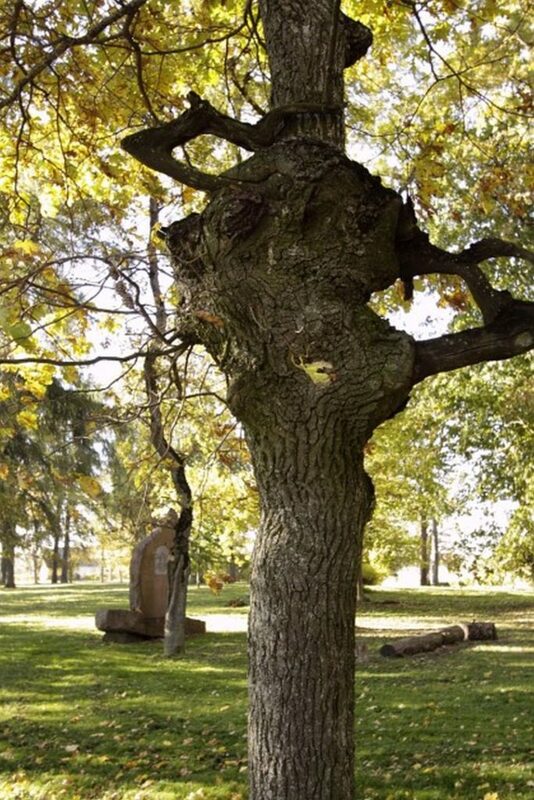 Even now, a common oak is growing in the cemetery with a similar trunk. Among the domestic elms, linden trees, ashes, oaks and maple trees, the main non-native species are the mountain maple and larch trees. The age of the Siberian larch growing near the main building is estimated to be more than 150 years. This gives reason to believe that the entire alley including 300-400 trees, could have been planted at the same time, in the 1860s. The northern part of the park, that is behind the manor house, used to smoothly turn into a forest, thus it is not possible to find out its possible past extent. By now, only isolated tree groups and concavities representing former ponds, still remain of the posterior part of the park. There used to be a fruit and ornamental garden behind the barn building as well, unfortunately this has not survived. Today, this area has some of the oldest apple and pear trees. There used to be a cold and a warm greenhouse, which even had magnificent agaves growing in it. The Kukruse manor alley and cemetery were taken under protection in 1997. On 28th June in 2004, the Economic Affairs’ Committee of the Parliament decided to allow the expropriation of the Kukruse manor to the Kohtla municipality by the Ida-Viru County Government. In August of the same year, brainstorming sessions were held by IVEK for finding out what makes Kukruse manor unique and how to develop it further. The polar topics related to the manor were highlighted by the historian Vallo Reimaa in the very first meeting with the support of Tiit Saare. On 3rd September of 2004, the Ida-Viru County Government gave the manor complex to the Kohtla municipality. I project application: 23.12.2004 – “The Development of the Kukruse Manor as a tourism and recreation complex” submitted to the EAS’s Regional Competitiveness Improvement Program. Negative decision. II project application: 29.08.2006 – “Kukruse Manor as an Attractive Tourism and Recreation Centre” – The Norwegian and European Economic Area’s regional grant. Negative decision. Then, the decision was made to write the project “The plan for developing the perspective of Kukruse Manor and the Marketing Plan” to the Regional Development Planning Program. From there, quarter of a million crowns were received for starting up the project. The generated content was used for writing the new project “Renovation of the Kukruse Manor and the Creation of an Exposition”. The funds were received from the Estonian Regional Development Fund via the support action “Strengthening Regional Competitiveness”. The decision was made by EAS on 30.09.2008 with the final cost being 24 512 851,53 crowns. Kukruse Polar Manor is the only collection of its kind in the world. This is the lovingly and caringly restored home of the von Toll family, which was opened in 2010 and bears the name of Polar Manor in memory of Eduard von Toll.